I should introduce myself. My name is Marc and I began to work for Codegram at the end of 2011. In these two and a half wonderful years I’ve gained (so it seems) their trust and I became something like their marketer. We decided to diversify the content of our blog a bit, so here it goes something about (my) sector and how it affects to (your) sector. As you’ll be able to read between lines, I'm quite a fan of the AMC’s series, Mad Men. All advertising students (just as me) should take their time and watch this series very carefully, so they’ll discover what are not going to live in their future professions. In that golden era, there was a clear and visible way for you and your company to have success. You just needed a magical mind to create catchy ads (an spanish Don Draper) and advertisers came alone, everything was fine. I remember with special affection a scene of the first episode of the first season. If you’ve seen it, you’ll know what I mean, the one where Don sells the slogan "It's Toasted" to our friends from Lucky Strike. 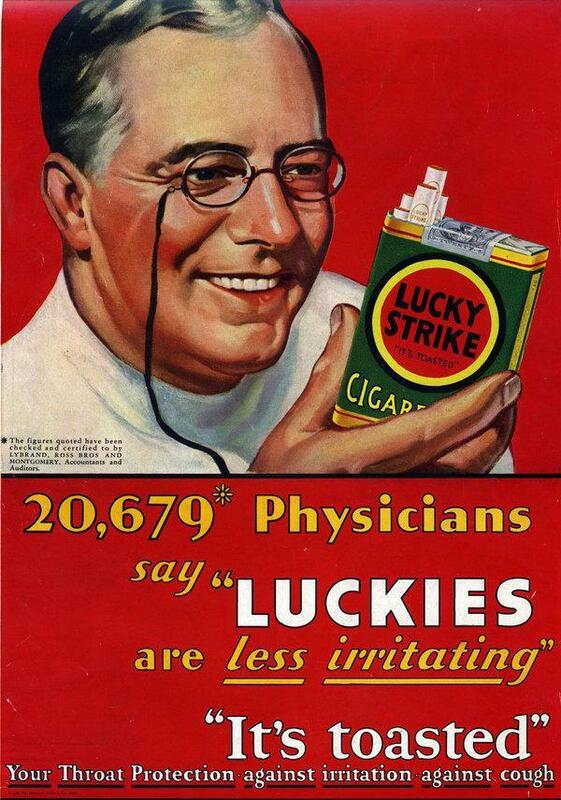 Now this appears to us an atrocity, but by then, the advertisers were able to convince an entire health system to sign a paper certifying that Lucky Strike was good for your throat (I’m not dreaming this up, really happened this way, as it is). So, a compelling guy and a slogan, and the work was done. No matter if your product was good or bad, indifferent or mortal, it was going to sell by the divine grace that enveloped the entire sector. If you are curious about which was the original Lucky ad -not fictional-, you can find it at this link. But then, the storm approached. Just when our colleagues were beginning to enjoy cigars, “carajillos” first thing in the morning and the rockstars’ way of life, the advertising world changed, it seems that forever. The Mad Men lived with 4ps marketing strategies. Don’t be scared, I know your teachers still teaching it at the college and they say that's what it takes now, but it really doesn’t matter too much if you remember them. Even then, the "P" key was the Promotion. Now this "P" so magnificent and omnipresent in the past, it has been deflated, it has lost magic. Consumers have asked the sector for a divorce from promotions. They have awakened from their slumber and realized that they deserve something better. Don’t get it wrong, I’m not blaming the customers and clients of this change, they just woke for our fault. We became them into cynical machines with our overdone promises that were less realistic than the poor man who tried to fly by jumping from the Eiffel Tower. The changes in communication, such as reducing the relative distances between people (see I speak of people as potential customers), have also had their share of blame. However, the change in capital letters has been Internet, which includes websites like social networks, driven by user-generated comments. These users have changed from a passive to an active role, where every of your actions has a major impact on your brand image. If I had to define the current situation in one sentence, it would be something like this: “Customers don't give importance to what you can say about your brand unless it matches the brand experience they, their friends or any trustworthy person have had with it”. In fact, the will rather believe the opinion of a blogger, a total stranger, than your company's communication strategy. Humanoids employees (using a futuristic approach): The importance of people who "humanize" your business and interact with customers, either directly or indirectly. Humanoids relatives (futuristic, yeah): Those people who your customers know, listen and trust in their personal life. Humanoids from the Internet (I know I'm tiresome): People who develop their opinions on Internet communities. Remember, your customers hear and trust their points of view. The world is a bad place, full of twists and turns. I know it's scary to go out there, I understand. But guys/girls, this is our world, a world where the people, my dear humanoids, are the only ones who say something about our brand or company. It is a grim and scary place for marketing professionals. Advertising has less credibility than a "0% fat" slogan in a McDonald's' commercial. However, no matter how hard we mourn and cry at every corner of our offices, it’s the world where all companies must operate, without crossing the line. They'll be watching. If you fail, not even the best product implementation in the world could save you. You will lose their support, and, with it, the chances of creating a successful company. I find ironic how this state of terror has changed hands. The customers are no longer afraid or seduced, deceived and/or cajoled by vendors with questionable morals, this is no longer working. The brands, if they aren’t dumb as a post, are the ones who live now terrified by customers. Hey, and with good reasons. The trends leaded by humanoids are dangerous up to unsuspected and sometimes curious levels -more if we continue with the mentality of "let's change something and see what happens, probably end up going well." Well, before you call me a heretic and come to my house with pitchforks, stakes and torches, here comes the good news: we have a chance to change and improve. Marketing Hero & Conferences Manager at Codegram // Student fueled by coffee. Lots of coffee // Full Stack Fest Organizer // Rock & Bike & Snowboard geek.